The installation CD that came with the ADSL gateway is only designed to work in a Windows-based computer. 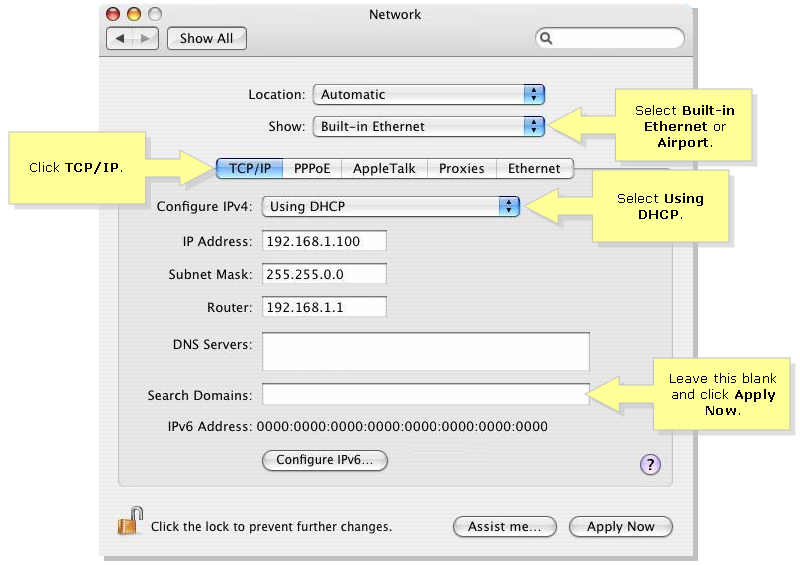 This is the reason why manual configuration of the TCP/IP settings of your MAC is needed. All you have to do is hardwire your Macintosh computer in the ADSL gateway, restart, and follow the instructions below. Click the Apple icon, select Location, then choose Automatic. Click the Network icon then select Automatic under Location. Click the TCP/IP tab and select Using DHCP under Configure or Configure IPv4. NOTE: Leave the Search domains or Additional search domains fields blank..
You should now be able to access the ADSL gateway’s web-based setup page and configure your ADSL gateway. For instructions when using an ADSL connection, click here. For instructions on setting up an ADSL gateway with a Static connection, click, click here.